MOSCOW, Russia -- U.S. suggestions on deploying a UN mission in war-ravaged eastern Ukraine look quite feasible and Russia will study them carefully, Kremlin aide Vladislav Surkov was quoted as saying by Russian media after meeting with his American counterpart, Kurt Volker. 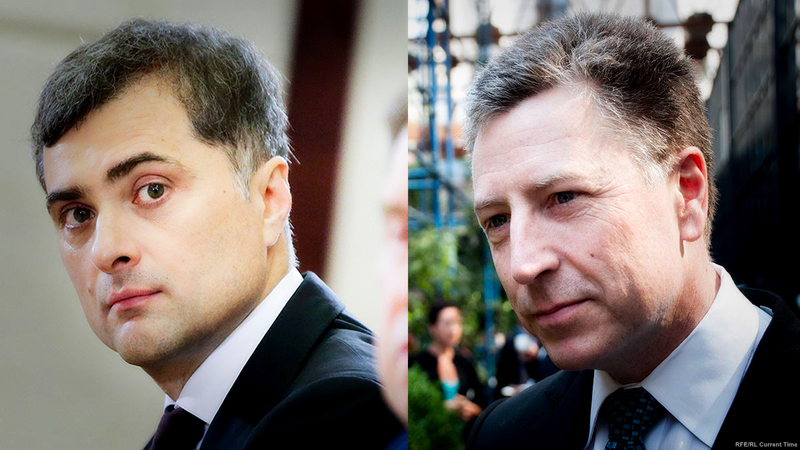 Kremlin aide Vladislav Surkov (L) and U.S. special representative for Ukraine Kurt Volker. Surkov and Volker held talks in the Gulf city of Dubai on January 26. Volker has made no comment so far on the outcome of the meeting, but has a phone briefing with the media on January 29. The plan swiftly drew criticism from both Kiev and the West, largely because of concerns that deployment along the front line rather than the Russian-Ukrainian border would cement Russian control over separatist-held territory and do nothing to stop Russia from sending fighters and weapons into Ukraine. "The main thing [in the U.S. proposal] is a rather detailed plan for a phased deployment of the [UN] mission in coordination with the implementation of the political points of the Minsk agreements," Surkov was quoted as saying by the TASS news agency and Komersant newspaper. "This is a balanced approach, on which we have insisted. We will study it carefully and promptly give an answer. Then we will invite Kurt and his colleagues to a new meeting," he said without offering further details.